The Trump administration's solar panel tariffs could threaten thousands of American jobs. On Monday, the administration put 30% tariffs on panels and cells coming from overseas. Tariffs will be in place for four years and will taper out. President Trump said Tuesday that the decision will create jobs and allow the United States to "make our own product again." The solar industry and economists pushed back hard. The Solar Energy Industries Association, a trade group, predicted the tariffs will cost the American economy 23,000 jobs, including existing and future jobs that would have been created. The tariffs are intended to boost U.S. manufacturers. After two foreign-owned companies filed petitions with the independent U.S. International Trade Commission last year, the ITC found that imported solar equipment hurts American manufacturers. SolarWorld, one of the companies that brought the trade petition, said it hopes the tariffs "will be enough to address the import surge and to rebuild solar manufacturing in the United States." Yet production jobs make up a tiny slice of America's booming solar business. The industry has moved away from manufacturing as cheap panels from Asian countries, especially from China, flooded the market. And American manufacturers have been left behind. Only 6% of panels in the world were manufactured in North America in 2016, according to the Fraunhofer Institute for Solar Energy in Germany. Varun Sivaram, a fellow at the Council on Foreign Relations, said the tariffs are "too little and too late" to make U.S. producers competitive with global peers. He believes the tariffs won't be enough to create incentives for investment in new U.S. facilities -- especially as they slow down and expire over four years. "Trump's tariffs are remarkable in that there are virtually no benefits to offset the broad damage they will cause," Sivaram said. Related: Did Trump just start a trade war with China? Instead, analysts expect the tariffs to slow solar panel sales in the United States. 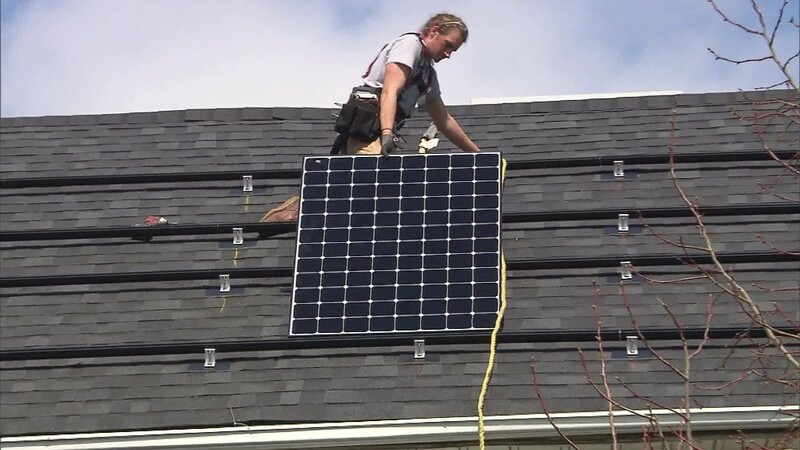 Solar panel makers will pass some of the cost on to customers, making them more expensive -- and less attractive, particularly in some markets where solar was just starting to pick up steam. "Areas like North Carolina, New York, and Washington, D.C., will see a cooling off period," said Bryan Birsic, CEO of Wunder Capital, a firm that develops and manages solar investments. If sales slow, the industry will need fewer installers, tapping the brakes on what had been one of the fastest-growing industries for jobs. Solar jobs grew 17 times faster than the overall U.S. economy, according to a report last year by the International Renewable Energy Agency. In 2016, there were 260,000 solar jobs in the United States. Half of those were commercial and residential panel installers, according to the nonprofit Solar Foundation. Only 14% are manufacturing jobs. "There is no question that installation jobs will be lost," said Shawn Kravetz, head of Esplanade Capital. --CNNMoney's Patrick Gillespie and Daniel Shane contributed to this story.